To find the right performance measures, we must start with a clear definition of what a performance measure really is. How does your definition compare to this one? Firstly, forget about the SMART acronym. SMART means specific, measurable, achievable, relevant and time-bound. It’s a very good framework to test that your goals are well-formed. But, SMART is not a measurement framework. Relying just on SMART won’t help us find the right performance measures. To find the right measures, we need a clear definition of what a performance measure really is. 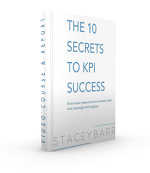 It doesn’t matter if you call them KPIs, metrics, performance indicators, performance measures, or whatever other term we might use. When I refer to a performance measure definition, I also mean a KPI definition or a metric definition. So, whether we call them KPIs, metrics, measures, indicators, key, lead, lag, or whatever, they must satisfy the above definition if they’re going to drive performance improvement. A method of COMPARISON to know when performance is good or not. A base of OBJECTIVE EVIDENCE that gives a reasonably accurate and reasonably reliable picture of what performance currently is. It always frustrated me in performance review meetings just how much time decision-makers would spend arguing about the data integrity of a measure, as opposed to using that measure to inform them. 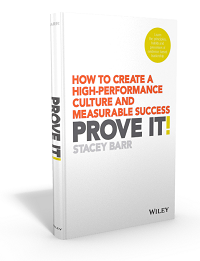 Performance measures don’t need to have perfect integrity. They do need to have enough accuracy and reliability to be trusted as information that will lead to a better decision than no decision or an uninformed decision. A sufficient DEGREE of granularity to detect small but important changes in performance you should respond to. The way we design our performance measures can impact on the granularity – or sensitivity to change – that those measures are capable of showing. Measuring degree means, for example, using a 10-point rating scale rather than a yes/no scale. Measuring degree means our measure can take more possible data points. And this helps us pick up signals of change, and triggers to take action, sooner. Being relevant to important PERFORMANCE RESULTS relating to the priorities for organisational improvement. We measure lots of things in business. But not all measures are “performance measures”. Not all measures deserve the same amount of our time and attention. Not all measures need to be acted upon. 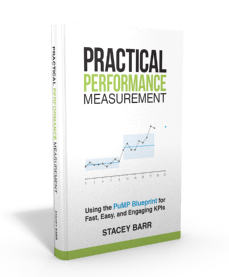 Performance measures are the subset of measures that track the performance results that are the biggest priorities right now. Unless we design measures that give us regular feedback through time, we’ll be faced with too little information, too late. We won’t get the information that will help us fine tune our strategies (those activities, initiatives, projects, and such that are supposed to make performance better) to ensure they actually do produce the improved results they were supposed to. Performance measurement isn’t a post mortem, it’s a health plan. So what’s more important to you? Getting your performance management terminology perfect, or getting good measures of performance that meaningful focus everyone on what most needs to be managed and improved? Performance measurement isn’t a postmortem, it’s a health plan. I want to specifically focus on this line of yours. I see performance measures as a means to take “preventive action” ( health plan) than “corrective action” ( postmortem). The moment someone realises this , there is a whole bunch of options for business improvement that comes their way. They also lead us to opportunities though proaction. Thus performance measure is not necessarily a problem solver but also an opportunity giver. I live and work in a country context where a very large part of the economy is bundled into “State Owned Enterprises”. The overall level of data collection is dismal, save for the reporting on financial results that is obligatory. Your article is very useful indeed – liked the ‘fresh’ take on what’s important, as opposed to the clever SMART approach, which many management teams don’t succeed in implementing in any case. Of particular value to me are your points on ‘Granularity’ and ‘change Over Time’. I know what performance measures are and have taught measures many times but I find your definition most explanatory. The breakdown of key elements of the definition and fully explaining each of them is very educating. Thanks. What u say is true but every problem is an opportunity. When you are doing corrective action, you can come out with creative solution as well. Thus I see it as a perspective issue rather than the terminology issue. The kpi we set need to be based on issues, improvement and information we got from the customer. Therefore corrective action is to address the issue we are facing now which stops us from achieving our corporate objectives. So, I think performance measures need to be both health plan and postmortem.